The Aaron Cohen Life Protection Act has become law. Let's show our support by attending the signing ceremony on bicycles! Please plan your starting times accordingly for all who are biking to the event! "Do you guys remember that day in February 2012 when over 1,000 of us rode to honor Aaron Cohen's memory? We rode that day to mourn the loss of another one of our cycling brothers to a preventable tragedy on our roadways. On Wed., July 16th, 2014 - exactly one year and a half since the sentencing of the man who killed Aaron Cohen - we will ride and come together once again in Aaron Cohen's memory, but this time we will to do so knowing that it is in HIS name that future hit-and-runs WILL be prevented and families will be saved from the pain and anguish that the Cohens have had to endure thanks to the passage of the Aaron Cohen Life Protection Act by the FL Legislature. 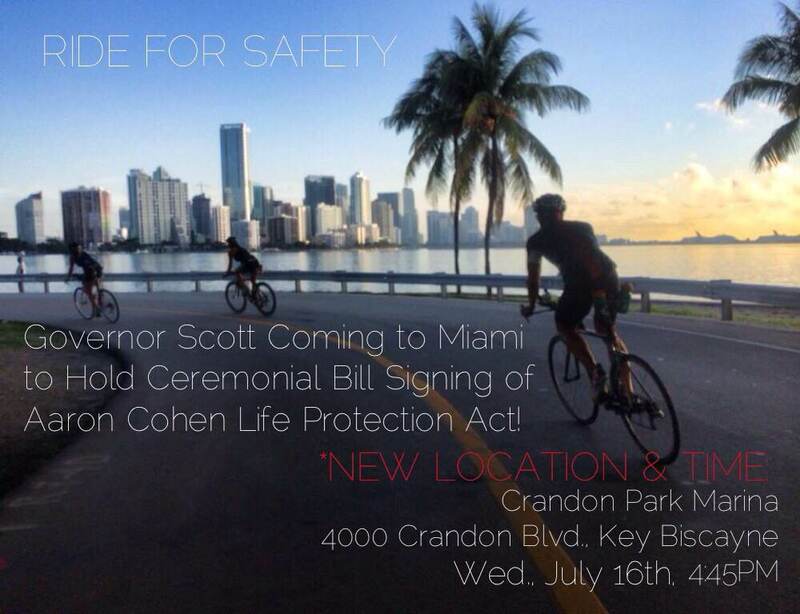 Please use this event page to coordinate starting points for meet-up rides throughout Miami in order to bike en masse over to the Key for the signing, which will start promptly at 4:45PM. Hope to see you all there!" Here's a video from the ride in honor of Aaron Cohen back in February of 2012.